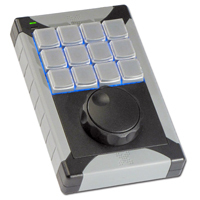 The X-Keys XK-12 plus Jog and Shuttle from PI Engineering is a 12 key programmable keypad with a user defineable to scrub timelines or jog frame by frame. 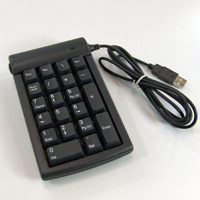 Programmability includes macros, hot keys, or multiple steps or sequences. Other features include: red and blue backlighting for each key, and key caps and key blockers for creating custom layouts. Whether you are a Graphic Designer, an Architect, a Web Manager, or a Two-finger Typist, proficiency in your software requires rapid input. 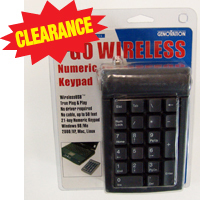 Keyboard Macros and Hot Keys offer the shortest path to action, and the X-keys provides a clearly labeled, physical location for these complex or redundant functions so you don't have to think about them. The X-keys lets you focus on the project instead of the process. There are two models of the USB version. The XD-293 come with pre-printed legends for commonly assigned tasks (on the bottom of the plastic keycaps), but these legends can be covered with the included blank labels to allow you to customize as needed. 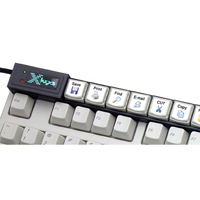 The XD-03 has blank plastic keycaps (i.e. nothing initially pre-printed on the units). 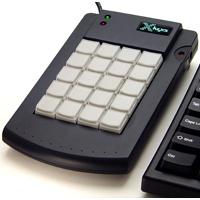 Note:These X-keys devices have been discontinued. 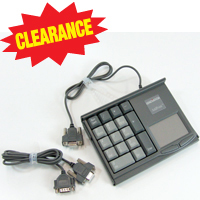 We have a limited supply in inventory available for use in legacy systems. Programming of these devices may not be supported in current operating systems. Please see our recommended replacements here: XK-24 and XK-60. Whether you are a Graphic Designer, an Architect, a Web Manager, or a Two-finger Typist, proficiency in your software requires rapid input. 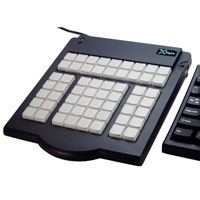 Keyboard Macros and Hot Keys offer the shortest path to action, and the X-keys provides a clearly labeled, physical location for these complex or redundant functions so you don't have to think about them. The X-keys lets you focus on the project instead of the process. 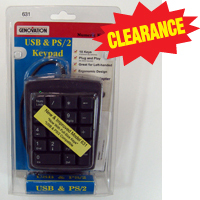 Includes precut legend sheets to make it easy to hand inscribe labels for your keys.